Gift a surprise of sweet treasure by delivering our Delicious Kaju Pista Roll. 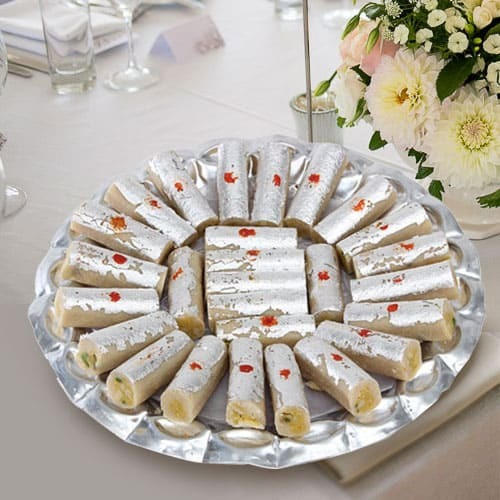 The recipients will savor the taste of this 1 /2 Kg (Gross Weight) Haldiram Kaju Pista Roll. Flowers Delivery Jamshedpur, Send sweets Tirunelveli, Wedding Cake Adilabad, Diwali Mithai Karauli, Send Flowers and Gifts to Kasargode, Online Shop Barasat, Flower to Raichur, New Year Flowers Modinagar , Fresh Fruits Ambala, Send Gift Mangalore, Dry Fruits to Bilaspur, Birthday Delivery Madanpalli, Sending to Nadiad, Flower shop Karimnagar, Kottayam Online Cake Delivery.